Hi and welcome to another edition of Art and Zen Today. Today’s post consists of more video from my Shuso Hossen Ceremony. We start off with Eyal Raz reading Rumi’s “The House Guest. This is one of three short stories read by Eyal during the Ceremony. All of them come from a tradition other than Zen but all convey the same depth of wisdom found in the most profound Zen texts. The texts of the other two stories read by Eyal are printed below. Following that is the second of my performance raps, which were intended as responses to the Koan I was given. 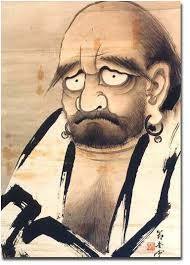 It’s called “Master Bodhidharma, Bodhisattva Bodhidharma”. For more on the Shuso Hossen Ceremony and other topics related to Zen and art use the SEARCH option or click on relevant CATEGORY at the right. In the first day – God said, Let there be light: and there was light. In the fourth day – God said, Let there be lights in the firmament of the heaven… to give light upon the earth. Question : What did happen to the first, primordial light after the light in the firmament of the heaven was created? Question : For whom did he hide it? Question : How can we observe it? Answer : It is reflected in their daily activities. The idea that the soul will join with the ecstatic just because the body is rotten that is all fantasy. If you find nothing now, you will simply end up with an apartment in the City ofDeath. Kabir says this: When the Guest is being search for, it is the intensity of the longing for the Guest that does all the work. This entry was posted in Performance Art, Shuso Hossen Ceremony, Sound Music, Video, Zen Practice and tagged Bodhidharma, four vows, Rumi, Shuso Hossen Ceremony, The Vista Zen Center, Zen Koan by Steve. Bookmark the permalink.